undefeated heavyweight world champion Deontay “The Bronze Bomber” Wilder retained his WBC title in his seventh defense with a 10th round knockout over unbeaten challenger Luis “The Real King Kong” Ortiz in a thrilling battle that was a back-and-forth barnburner. The event aired on SHOWTIME CHAMPIONSHIP BOXING, as their run of fights continues. Wilder moves to 40-0 with 39 KOs but it wasn’t easy. Deontay bit down and survived the toughest test of his career but also finished the job in tremendous fashion, as he let loose a volley of punches during a 10th round attack on Ortiz, who suffer his first defeat and falls to 28-1 (24 KOs). There were two knockdowns in the that electrifying round, as referee David Fields had no choice but to call the action. And to think, just a few rounds prior, in the seventh, it was Wilder who appeared to be out of the fight. It all started with a strong right hand from the Cuban southpaw that hurt the WBC heavyweight champion. Ortiz stunned Wilder, who somehow managed to stay on his feet to close the round before being saved by the bell, in the face of a wave of murderous punches from Ortiz. 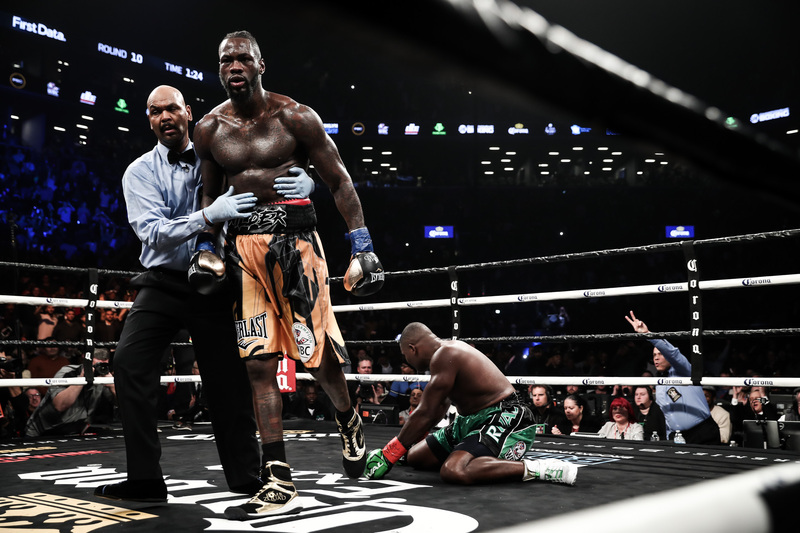 Ortiz continued his assault on Wilder into the eighth round, and it was obvious that the champion was trying to simply make it through the stanza and buy his time. It was the ninth round where Wilder appeared to bounce back, as he began to catch Ortiz with some shots and turn the fight somewhat back in his favor. The momentum was back in the American champion’s favor. The 10th was one of the more memorable rounds of the year. The two men traded powerful blows in the center of the ring and appeared to stun each other at the same time. But Wilder came through, scoring a knockdown moment later, as a barrage of thudding blows found their way through the Cuban’s guard despite Ortiz staying as poised as he could in the face of such an onslaught. Another knockdown followed and that was the end of one of boxing’s most exciting heavyweight fights. The right uppercut that ended matters was especially brutal. Growing as a fighter and in popularity each time out, a very emotional Wilder spoke to SHOWTIME Sports reporter Jim Gray about the 40th victory of his career. The post-fight scorecards had Wilder slightly ahead, and Ortiz was able to reflect on his view of coming up just short. Wilder out landed Ortiz 98-87, but to his credit Ortiz held an advantage in landed power punches, 63-60. The talk in the sport will once again go to Wilder possibly facing off with IBF/WBA champion Anthony Joshua. But first Joshua must face WBO champion Joseph Parker on March 31.